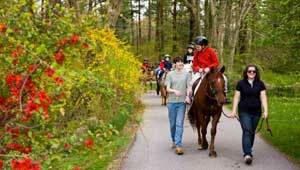 Every year, hundreds of children and adults with physical and developmental disabilities come to Windrush Farm, in North Andover Massachusetts, to participate in its innovative therapeutic riding program. In 2009, the landowner faced having to retire and sell. we worked with local partners and the Windrush Farm Therapeutic Equitation, Inc. to protect the farm and its valuable programs, the land from development, and save the riding center. A successful fundraising drive raised $1 million from private donors nationwide, keeping riders with disabilities tall in the saddle.